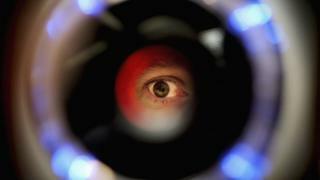 Facial recognition and eye scanning have been deployed at prisons to prevent drug smuggling. The Ministry of Justice said the biometric scans for visitors were designed to help staff identify people bringing in contraband. At one prison, there were more "no shows" from visitors than usual after they learned the scans were being used. But prison campaigners said if families were deterred from visiting, then it would be "counter-productive". In the trials, facial recognition technology was used at HMP Humber; iris scanners at HMP Lindholme; and identity document verification at HMP Hull. Ministers considered the pilot programme "successful" and are considering how to roll out the technology more widely in prisons across England and Wales. Last year prison staff across England and Wales seized more than 23,000 drug packages and mobile phones. Many methods were used to smuggle in the contraband, but intelligence work identified one trend in particular - prison visits. Over a six-week period in December and January, cameras scanned the faces of 770 visitors at HMP Humber, to spot if they were using false identities or making repeat trips to see different prisoners. Some visitors turned back after finding out facial matching software was in use. Justice Secretary David Gauke said: "New technology is vital in our fight against the gangs that seek to cause chaos in prisons, and this biometric equipment has the potential to significantly aid our efforts." He said that along with a prison officer recruitment drive, the technology would help to "make prisons places of rehabilitation where offenders can turn their lives around". It comes as the Prison Service struggles to stem the flow of the powerful synthetic drug Spice, blamed for outbreaks of violence, and illegal phones which are believed to be used to organise drug deliveries and intimidate witnesses. The Ministry of Justice said that prison intelligence has identified a trend of visitors supplying banned items to inmates. But those responsible have proven difficult to track because they may be using false identity documents to gain access to the prison, it said. Some prisons use fingerprint technology, but many rely on physical ID documents such as driving licences. Frances Crook, chief executive of the Howard League for Penal Reform said: "If families and children are being deterred from visiting, that would be counterproductive. "We need to see more of the evidence behind this apparent deterrent effect." The campaign group Big Brother Watch, which has launched a legal challenge to police plans to use automatic facial recognition in public places, said the prisons trial was a "total shock". It accused the government of taking an "experimental approach to human rights" by trying to win public acceptance for facial recognition cameras in controlled environments such as prisons, before it uses them as a general public surveillance tool.